Happy Mother’s Day to all you moms out there!! 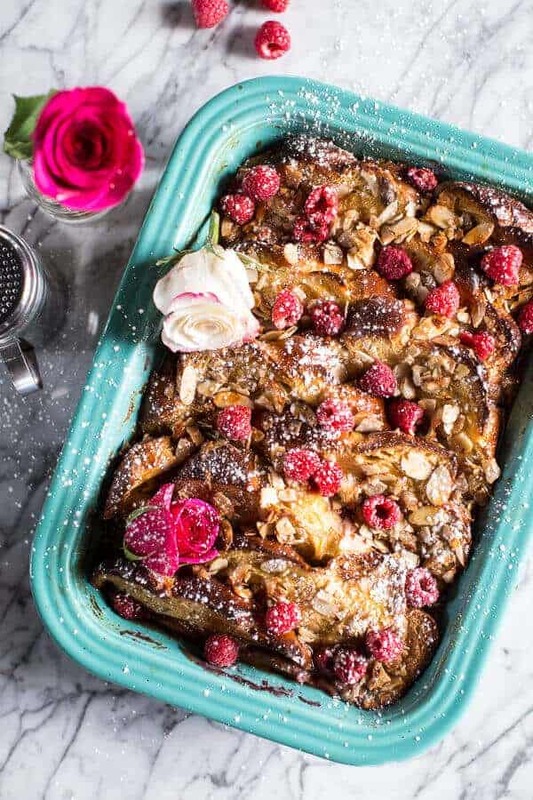 Just stopping in for a quick post to share this delicious raspberry rose baked french toast (gotta go pamper my mom you know!!). 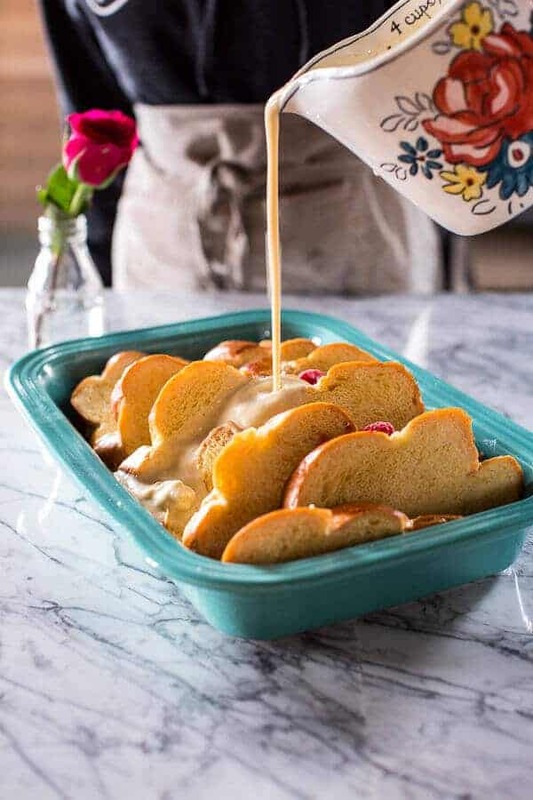 Perfect for an easy late spring/summer brunch, a girl’s gathering or just an extra special morning when in need of sweet, buttery baked bread! Of course, if you still have time, this would be an awesome addition to your Mother’s Day brunch. It’s kind of a show stopper, and I highly recommend making it for guests. Especially since you can prep everything the night before and then just pop it in the oven the next morning. I actually made this again today for my mom…she LOVED it. The perfect way to begin a day of “farming”, as we are now off as a family to check out a goat farm, buy some more fencing and then finish prepping “the homestead” for the goats arrival later this month. My dad spent yesterday afternoon building them a little shed (in the midst of a snow storm – yes snow storm!). Oh my gosh, the goats are actually happening. Whoa. Next. Next time it will be a horse… yeah! 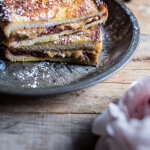 For now though, please go check out this french toast recipe on the Inspired Homes site. Pretty please with a cherry on top? You really do not want to miss it. Grease a 9x13 inch-baking dish (I love any of the Fiesta baking dishes!). 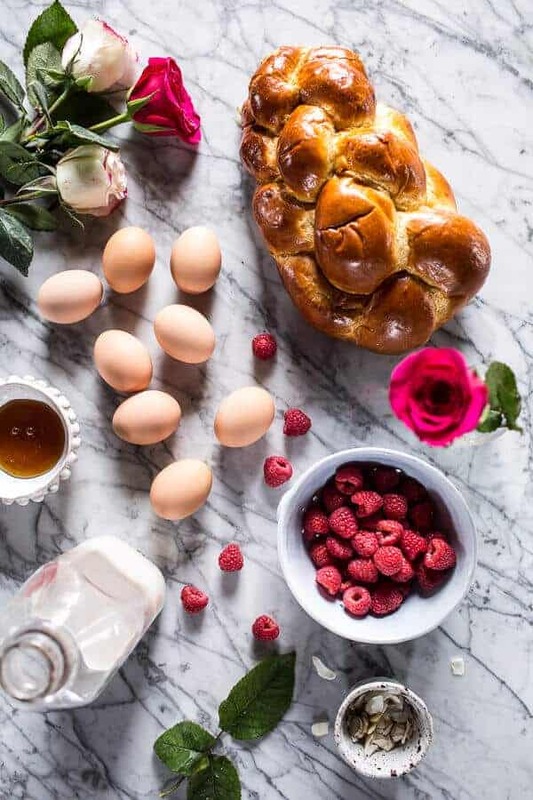 In a large bowl, whisk together the eggs, egg yolks, coconut milk (or milk), honey, vanilla, rose water, cinnamon, nutmeg and salt. In another medium bowl, combine the slivered almonds, coconut flakes and brown sugar. Add the butter and use your hands to incorporate the butter into the almonds + coconut. Sprinkle the mix overtop the bread slices. 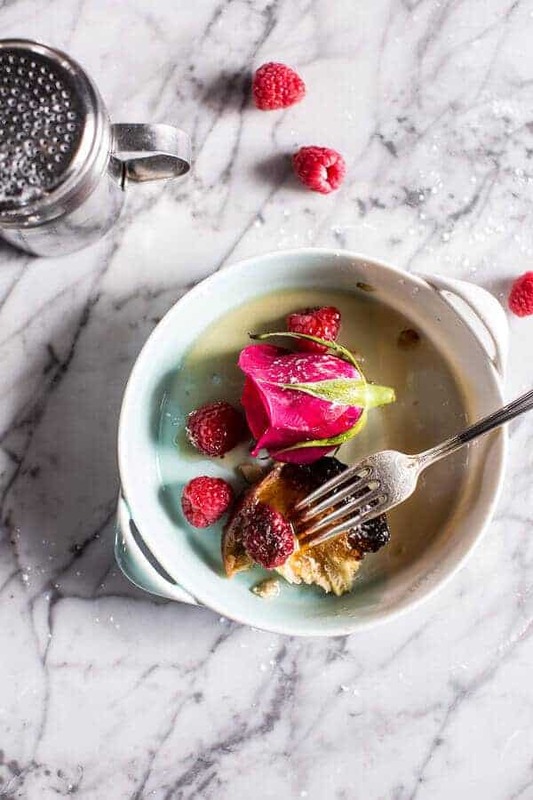 Sprinkle a handful of raspberries overtop. Cover and place in the fridge for 1 hour or overnight. When ready to bake, preheat the oven to 375 degrees F. Bake for 45-50 minutes or until the French toast is golden and crisp. If the tops of the bread begin to brown to quickly loosely cover the French toast with foil. I mean, aren’t they just so pretty??? I promise, they are just as delicious! Perfect for brunching!! Find the recipe here. Oh, and I hope everyone gets a chance to enjoy their mom today, make sure you let her know how special she is!! 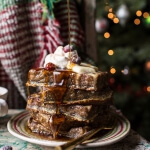 Baked Gingerbread Custard Waffle French Toast (VIDEO). 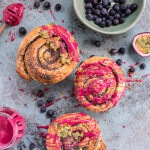 Meyer Lemon Poppy Seed Morning Buns with Blueberry Passionfruit Glaze. 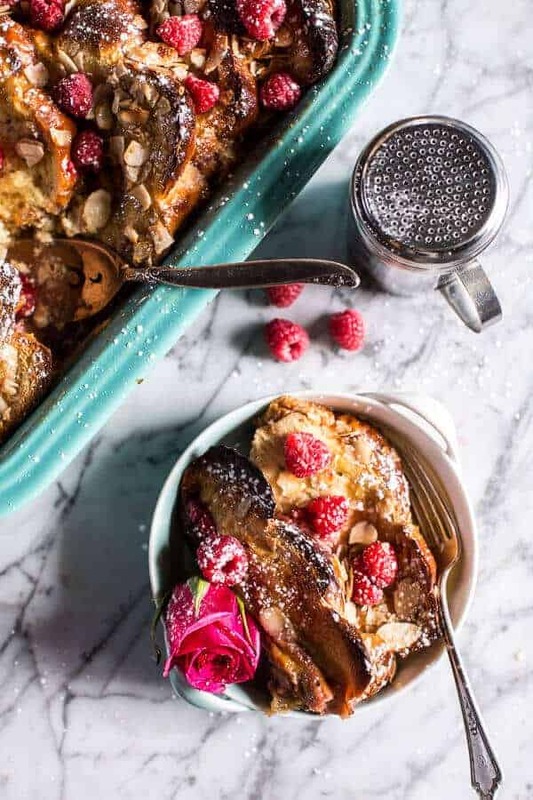 You can never go wrong with french toast (: Love the idea of almond/coconut streusel on top (as if raspberry/rose can’t sound any tastier!). Absolutely gorgeous! What a wonderful way to celebrate mother’s day. This is a stunner, for sure. Have a fabulous day with your mom! MINDBLOWN. Have to try this with Ezekiel bread! french toast.. i love that.. its been a long time since i had it. Seriously what is there not to love about this for reals? I mean it is fantastic. I know moms everywhere would love this! No better way to show love. So gorgeous, Tieghan! Love those pretty raspberries! Good evening. Just now catching up and I do not see the recipe for the French toast, at all in the article. what did I miss. ?? Photos are spectacular.. but no recipe of it can be found. btw Happy Mother’s Day to all Mother’s here at 1/2 Baked. This looks gorgeous. I absolutely love friends toast so this is super appealing to me. Love French toast. Your photos are gorgeous! 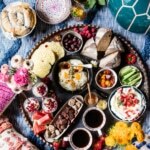 How / where do you get or make “rose water”? Since it is only a teaspoon is it truly necessary to the recipe? If it is I will do my best to come up with some. Thank you for your response and I am really looking forward to making this dish! HI! I buy rose water on amazon. Below is the link. Let me know if you have questions. Thank you! Also, if you would prefer, you can just omit the rose water from the recipe. No big deal! Let me know if you have questions. 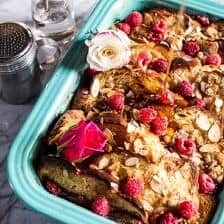 Could I substitute coconut sugar for the brown sugar? I know it’s not a lot, but that is what I have on hand. Thanks! Hi!! 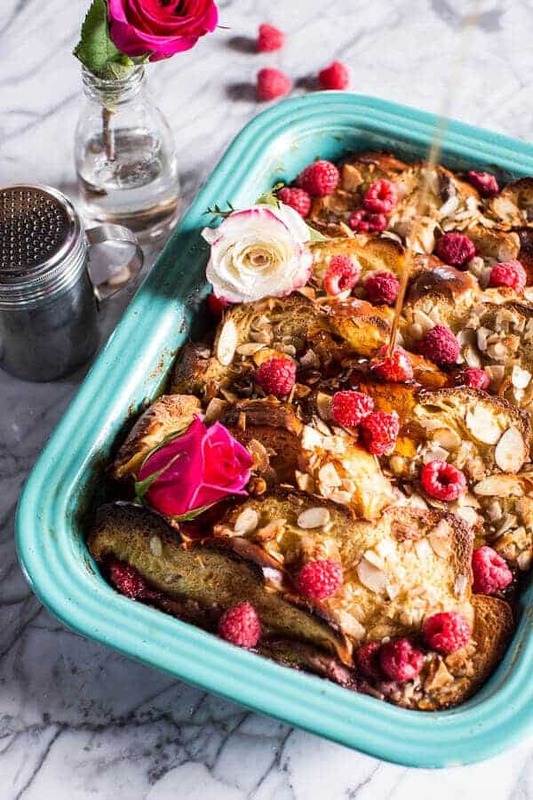 I’m making this lovely dish for Easter tomorrow, and wanted to know if the can of coconut milk should be unsweetened or sweetened? Thank you! I’ve made this recipe into a Christmas tradition. I love how you can prep the night before and just stick in the oven the next morning. Not to mention it’s a huge hit with everyone because it’s delicious! Thank you so much Neha! I am so glad this is now a family tradition!